A fruity selection of 5 distinctive varieties to grow from seed that makes a fabulous gift. The kit contains the following varieties, 1 packet of Alpine White Strawberry seeds (Fragaria Vesca) these incredible wild white strawberries are also known as Pineberries as they have the flavour of ripe pineapple! 1 packet of Wild Red Strawberry seeds (Fragaria Vesca) these delicious aromatic strawberries are easy to grow and produce masses of sweet tasting fruit which are particularly large for an alpine variety. 1 packet of Charantais Melon seeds (Musk Melon Type Emir F1) due to recent advances, these sweet juicy orange fleshed melons can now be grown in your garden! 1 packet of Goji Berry seeds (Lycium barbarum) Goji berries taste of cranberries, tomatoes and malt and being extremely high in anti-oxidants are often referred to as a 'Super Food'. Golden Berry seeds (Physalis Peruviana) each shiny golden berry comes encased in its own Chinese Lantern and tastes of gooseberries and tropical fruit with a bitter-sweet after taste, they make a great garnish and can be added to salads and salsa's, or alternatively used in jams or chutneys. Also included in the box are: 5 starter growing pots made from peat 5 peat blocks which expand when watered 5 plant markers and Sowing and Growing Tips. 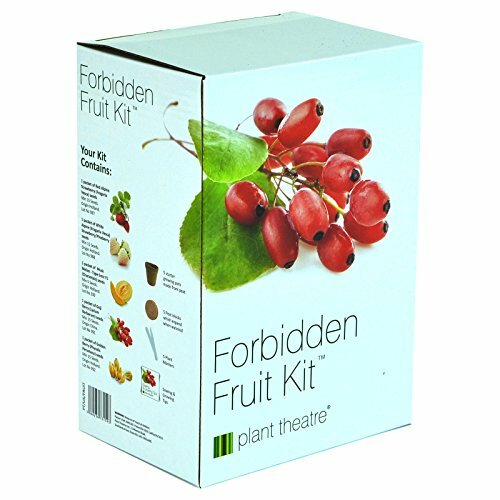 EVERYTHING YOU NEED TO START GROWING your Forbidden Fruit in one box, we've left nothing out! Ideal for beginners, gardeners and children alike. INCLUDES 5 Peat Growing Biodegradable Pots, 5 Peat Discs that expand to 7 times their size when watered, 5 Plant Markers and of course 5 foil sealed seed sachets, plus full SOWING & GROWING TIPS. YOUR FORBIDDEN FRUIT seeds include WILD RED STRAWBERRIES these DELICIOUS aromatic strawberries are easy to grow and produce masses of sweet tasting fruit, ALPINE WHITE STRAWBERRIES, also known as Pineberries as they have the flavour of RIPE PINEAPPLE! Encased in its own Chinese Lantern GOLDEN BERRIES are a great garnish, can be added to salads, salsa's, even used in jams or chutneys, CHARANTAIS MELON due to recent advances these SWEET JUICY orange fleshed melons can now be grown in your garden! GOJI BERRIES these wonderful berries which originate from China are very easy to grow, they taste of cranberries, tomatoes and malt AND being extremely high in ANTI-OXIDANTS are often referred to as a SUPER FOOD! A THOUGHTFUL GIFT beautifully presented in the illustrated gift box, this seed kit has everything you need to start growing, go on treat yourself or a LOVED ONE today! Home grown TASTES EVEN BETTER. If you have any questions about this product by Plant Theatre, contact us by completing and submitting the form below. If you are looking for a specif part number, please include it with your message.